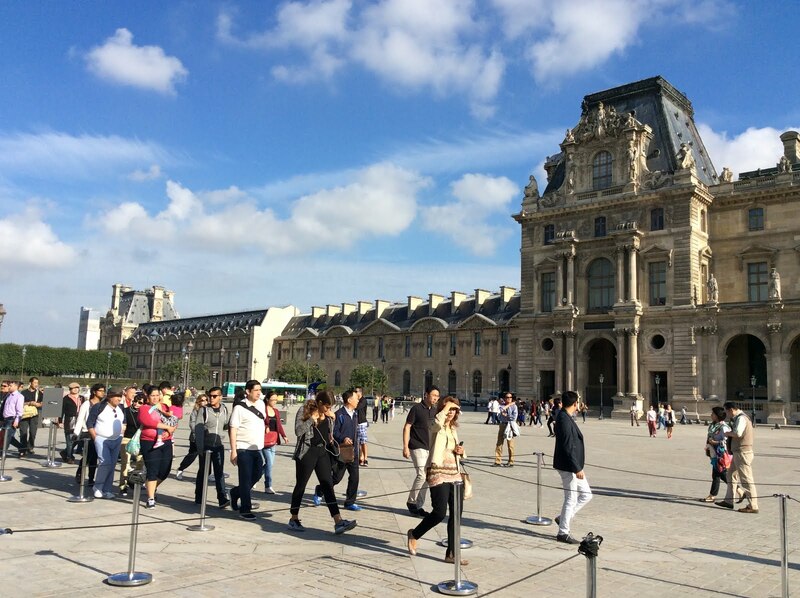 The Louvre Museum in Paris occupies a vast palace, consisting of several buildings arranged around two large courtyards. It was started by Francis I in the mid-1500s, and added to by successive monarchs, and later by the national government. The Three Graces, Roman, 2nd C.
Some of the Louvre's buildings are fairly plain and functional, but the original palace is decorated in a magnificent manner befitting royalty. 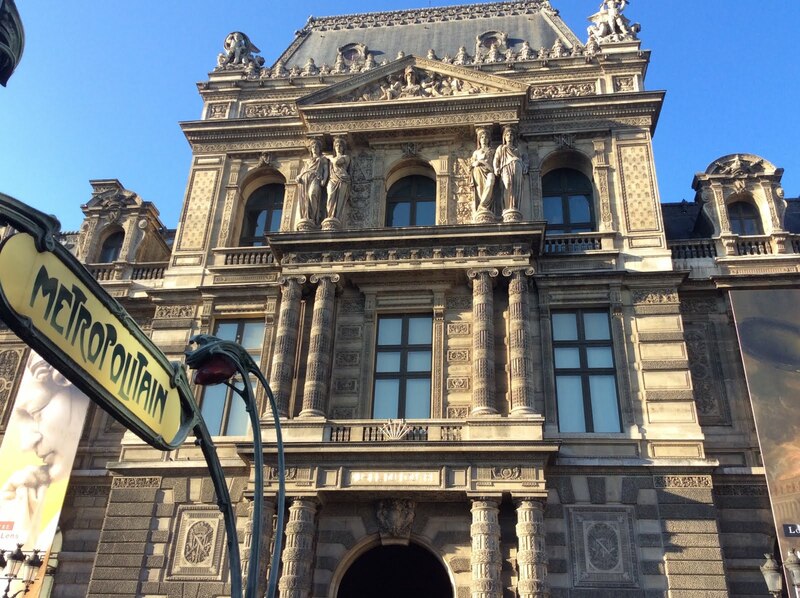 The Louvre's painting collection starts around the 11th century and finishes in the mid-1800s. 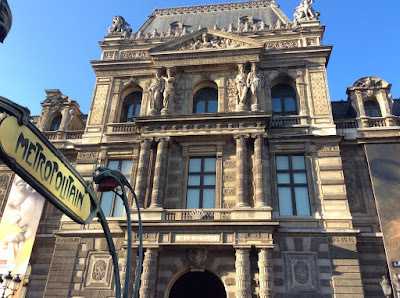 From that point, the Musée D'Orsay takes over the story. 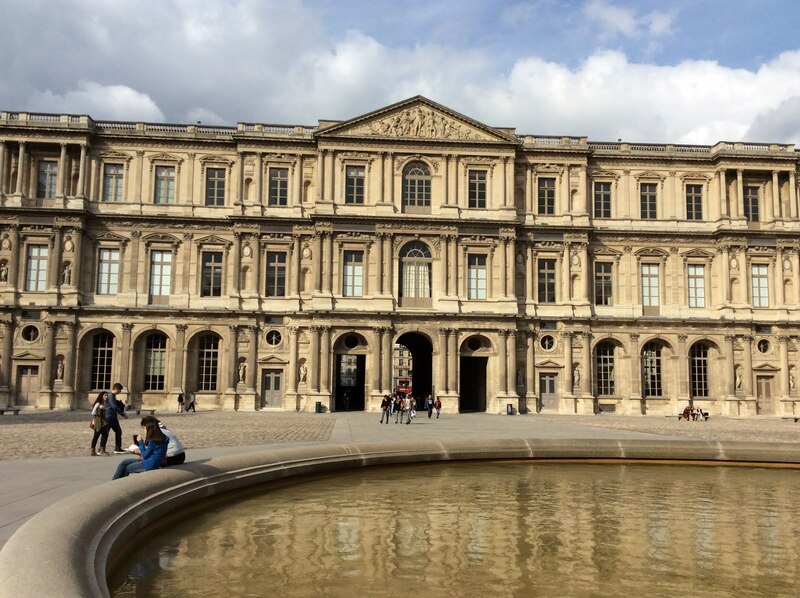 The Louvre has some of the earliest paintings to become significant in art history. 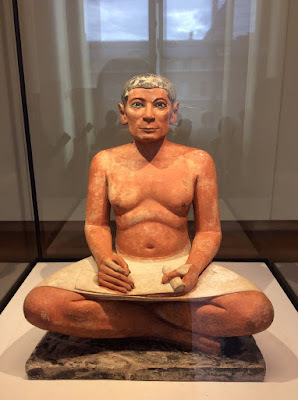 For students of art history, this is a good place to start. 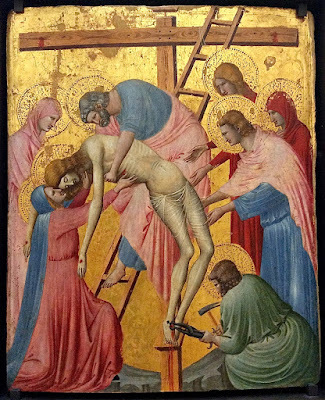 Painting as we know it got started in Italy in the 1200s. During the time of the Roman Empire, painting was basically confined to walls as interior decoration. Artists did not paint on separate panels, generally speaking. Also painters were anonymous craftsmen, seldom identified by name. After the Roman Empire in the west disintegrated in the 400s, there wasn't much culture or art for a Dark Age lasting a few centuries. The Barbarians who took down Rome were a tribal people who had no respect for culture, destroyed all the large institutions. And they destroyed the economy in which patricians would commission decoration for their homes. Power was dispersed among a multitude of private landholders who governed their own territories according to their own rules. The economy of Europe in general was at a subsistence level. The first institution to get back on its feet was the Church. "The Church" refers to the Catholic religion, as we now call it, though that term was not used at the time because there was only one Christian religion. Through regular donations by church members, the Church was able to accumulate wealth. The principal use for the Church's wealth was to build churches. It was a point of pride among the clergy and the worshippers to have as beautiful a church as they could afford. Thus the old tradition of painting on walls was applied to the walls of churches. 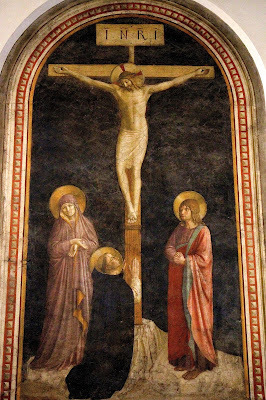 The earliest separate panel paintings were special works to be placed on altars as part of the worship ritual. Naturally, churches wanted paintings of religious subjects, and certain scenes representing religious stories formed a standard repertory: every church needed its Nativity scene and its crucifixion. Demand for religious decoration grew to the point that the most popular painters became known by name. At first the artists who worked on church decoration were anonymous craftsmen, as they had been in Roman times. By the 1200s city-states were gaining power, and enterprises were becoming wealthy through maritime trade. Leaders began to use their wealth to commission art. 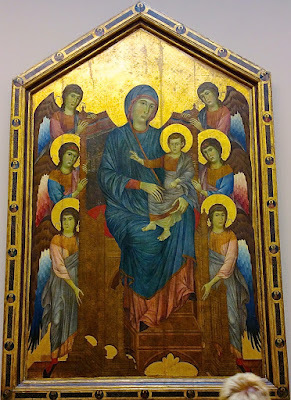 Cimabue was one of the first artists to be widely known by name. He painted altarpieces in the traditional style that was used for religious painting, which is sometimes called the Gothic style, because it was developed during the period of history when the Gothic invaders dominated Italy. 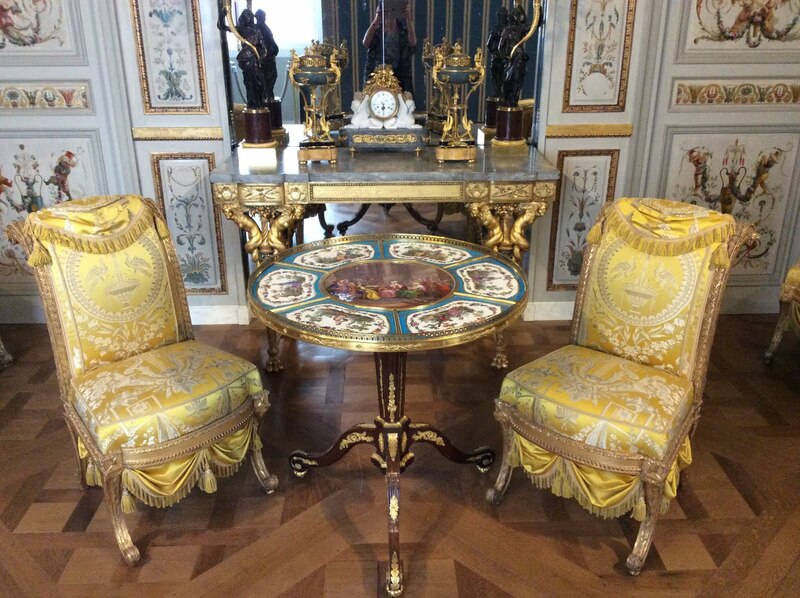 The Gothic style was flat and iconic, and featured extensive use of gold leaf. 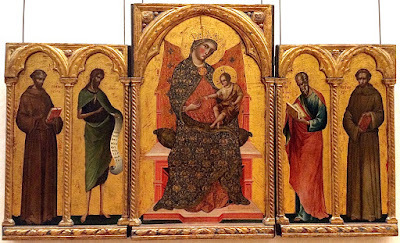 Cimabue is considered a fore-runner of the Renaissance style because his figures are more rounded and natural than the usual rendition in his time. 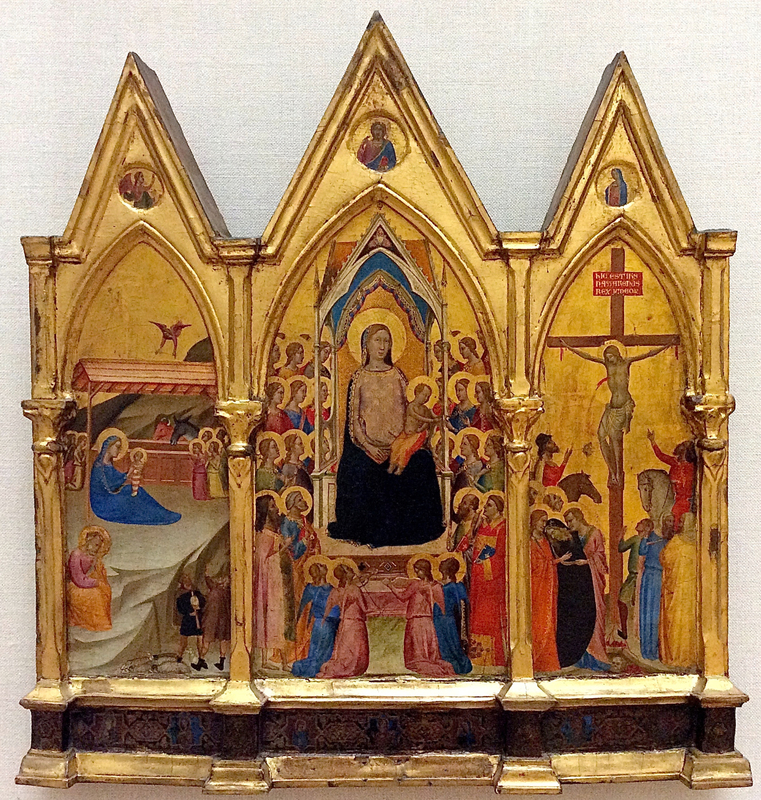 Altarpieces were the major form of art in the 1300s. Most were fairly large because they were intended to be seen from afar on the altars of churches; some were small because they were intended for home use. Altarpieces were intended to recall well-known stories in a schematic way, rather than trying to capture any part of real life. Two of the most important painters of Gothic altarpieces were Bernardo Daddi and Paolo Veneziano. 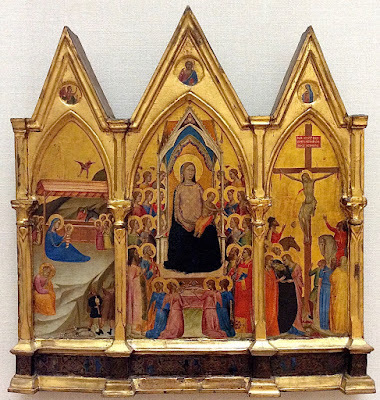 Larger altarpieces frequently had stands called predellas. Predellas were small rectangular panels intended to tell a story that complements the altarpiece. Being less dominated by rigid tradition, these panels sometimes had interesting details. The panel above has a lovely arched composition, starting with the green figure in the lower right, extending up through the pink and blue costumes of the men; on the left, extended arms pull the arch down to the red figure on the left. The pattern of pastel colors on a gold ground is very pretty. Then you notice the gruesome subject. 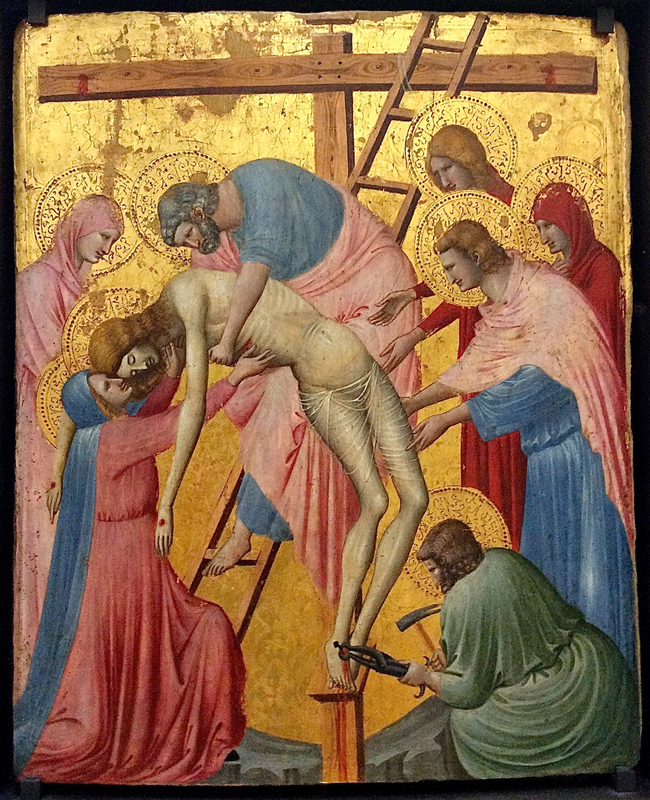 The figure in green is removing the nails from Christ's ankles, as the men lower the body from the cross into his mother's arms. This artist is not well-known, but clearly he was moving painting along toward a more realistic approach. The predella panel above is a humorous piece. 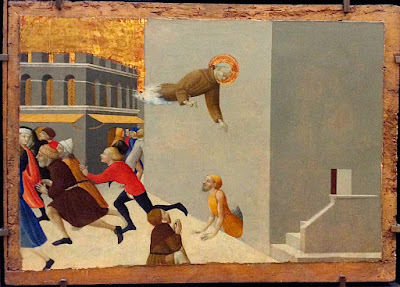 A saint flies in from outer space with an exhaust trail where his legs should be; he is liberating poor people from unjust imprisonment, as symbolized by a man emerging from a hole in a blank wall. During the 1400s, Italy went through a cultural revolution known as the Renaissance. By studying the relics and ruins of the pre-Christian era, scholars and artists rediscovered the values of Greek and Roman culture. Classical culture placed humans at the center of their philosophy; they had humanistic values, as opposed to the Church, which placed Christ at the center of everything. The Renaissance affected painting in many ways. Figures became more rounded and dimensional. Space was created by indicating perspective. Composition became less schematic and more dramatic. Subject matter was still dominated by religious stories, but mythological stories and portraits were also gaining popularity. Oil painting began to replace tempera. Oil-based paint is easier to use than egg-based paint, and it provides more potential for rich colors and subtle shading. 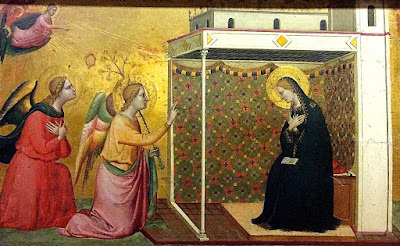 Fra Angelico, a friar in a holy order, was an important innovator of the Renaissance style. 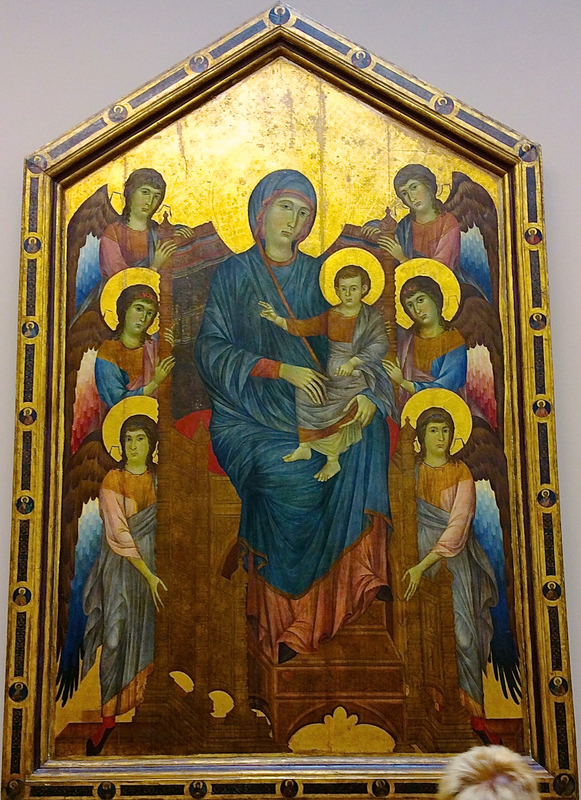 The very large example above is from early in his career, and has an old-fashioned look, but notice that these amassed saints and angels are actually quite a lot more natural, and a certain amount of receding space has been defined for them. Along the bottom is a predella. 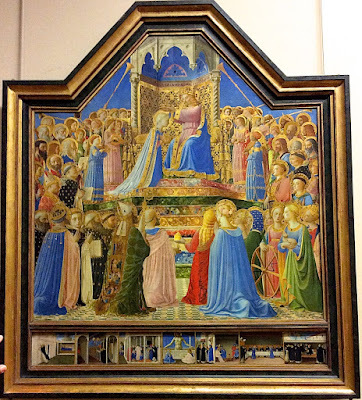 This example from over 20 years later lacks the colorful appeal of the Coronation, but it shows that Fra Angelico became more concerned with dimensional modeling and psychological effect. Mantegna was an early Renaissance painter who is associated with the development of linear perspective in painting. The geometry of receding space had been formulated by an architect and artist named Brunelleschi. In the painting above, Andrea Mantegna showed full command of both spatial perspective and human anatomy. The painting depicts Christ and two thieves being crucified. The contrast is stark between the weeping women and the Roman soldiers gambling. Botticelli was one of the greatest Renaissance painters. He filled the usual type of religious commissions, but he is best known for scenes based on classical mythology. He is known for graceful figures, clear contours, and balanced compositions. 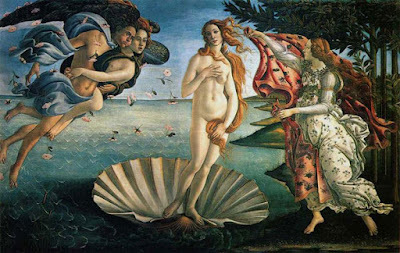 The most beloved works of Botticelli are in the Uffizi museum in Florence. 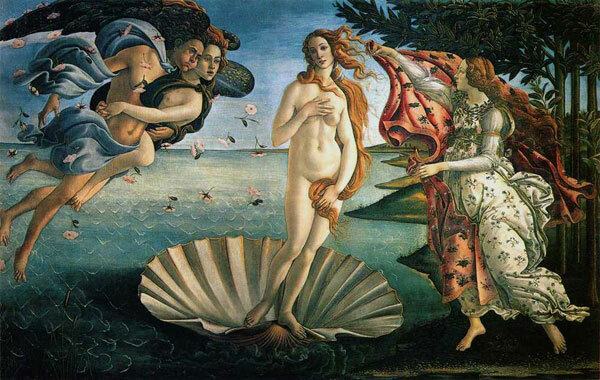 You may associate the name with The Birth of Venus and Primavera, both of them expressions of classical mythology. 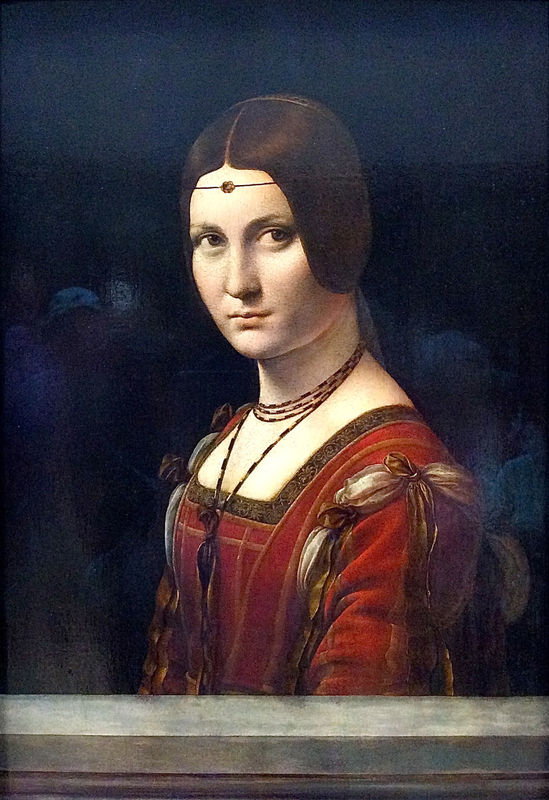 The Louvre had this a marvelous portrait. The Louvre also has some rare frescoes by Botticelli. 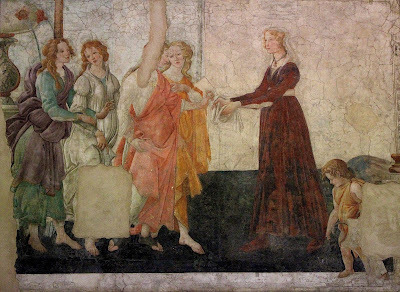 Fresco is a technique of applying tempera paint to wet plaster so that the color bonds to the plaster as it dries. The resulting image is less vivid than those made with oil paints, but the dry, flat look has its own appeal. Because it requires a team of technicians to assist the painter, fresco was generally used for churches or other public buildings. The fresco below is rare because it was painted for a private residence and it represents mythological figures, rather than religious icons. 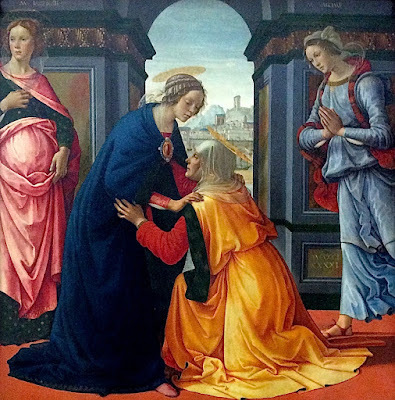 Ghirlandaio was a major painter of the high Renaissance. His style was influential because he had many apprentices, including Michelangelo. Ghirlandaio painted frescoes directly on the walls of churches, and he painted relatively few panel paintings that museums might later collect. This example shows the Virgin Mary greeting her cousin Elizabeth, who, despite her advanced age, is pregnant with John the Baptist. 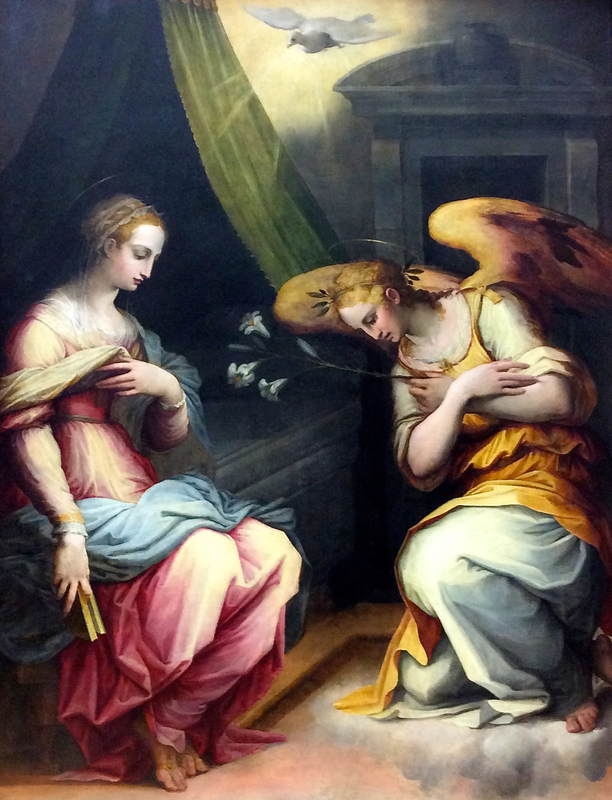 Mary went to visit Elizabeth in another town right after the Annunciation. Even though Christ was unborn, Elizabeth was aware of his divine presence. 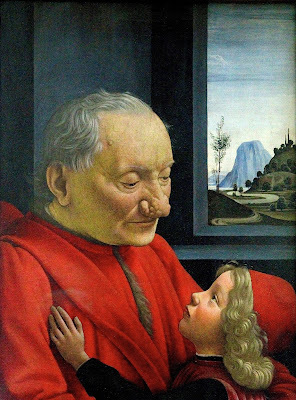 The painting above is remarkable for its lack of idealization of the Old Man; the Young Boy, however, is more idealized, and has appeared in other paintings by Ghirlandaio. 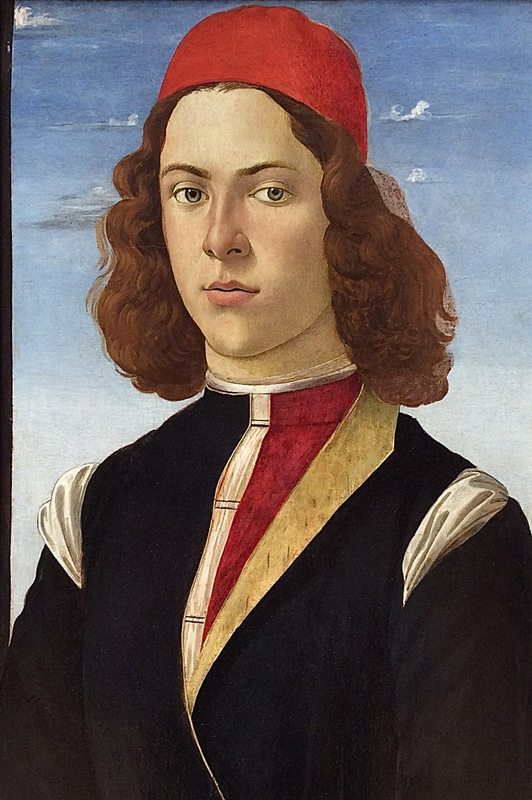 Pietro Perugino had the Renaissance style down pat except for the fact that his faces always seem so bland and expressionless. One reason for his enduring fame is that he was a teacher of Raphael. Leonardo da Vinci could do anything. Besides being one of the greatest painters of all time, he was a scientist and inventor, and he sold his skills as a military engineer as well. It seems likely that painting was a little too easy for him, and his genius constantly sought new challenges. He didn't complete a large body of work, but each piece seems to be the pinnacle of its type. This is a perfect example of how a painting can have psychological validity without being realistic. The top face represents Anne, mother of the Virgin Mary. Her loving and protective gaze leads us down to Mary, whose rounded posture and sweet face express total devotion to her son. Her arms direct our sight toward the child, who seems to be trying to ride a lamb. All that motherly love directed toward a playful toddler seems so right. But wait a minute: have you ever seen a woman sit in her mother's lap? Is it even possible? Is Anne much larger than Mary? Their positions symbolize motherly affection, without really being true to life. The idealism of the vision is underscored by the hazy blue background. 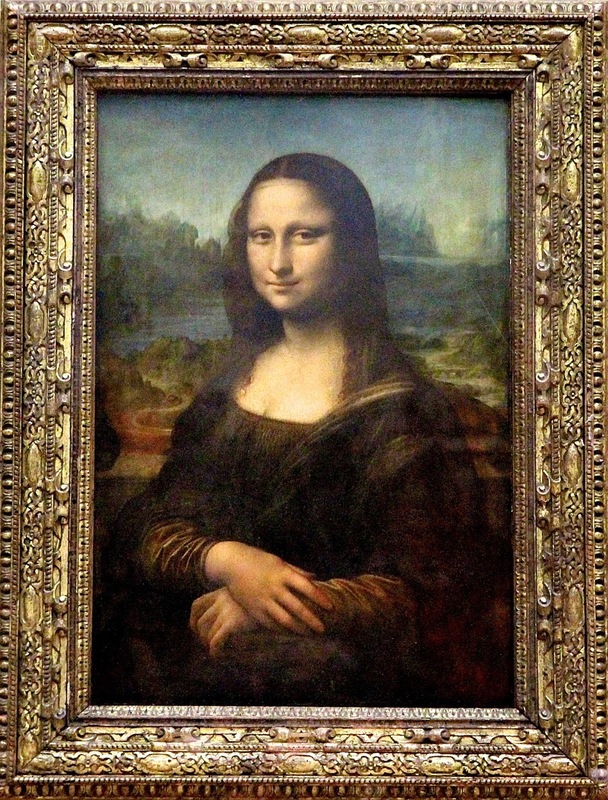 Of course, the Mona Lisa is Leonardo's most famous painting and the most famous painting at the Louvre, but people are often disappointed when they finally bust their way through the hoard of tourists taking selfies with this iconic image. 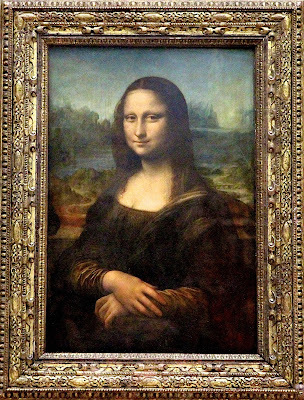 The problem with Mona Lisa is that its colors are distorted from the way Leonardo originally painted it. Some of the pigments were organic and faded: that accounts for the missing eyebrows, for instance. Varnish was applied early on which darkened the original tints. According to a contemporary writer, the portrait was notable for its rosy skin-tones. Her dress should be forest green with lustrous red sleeves. 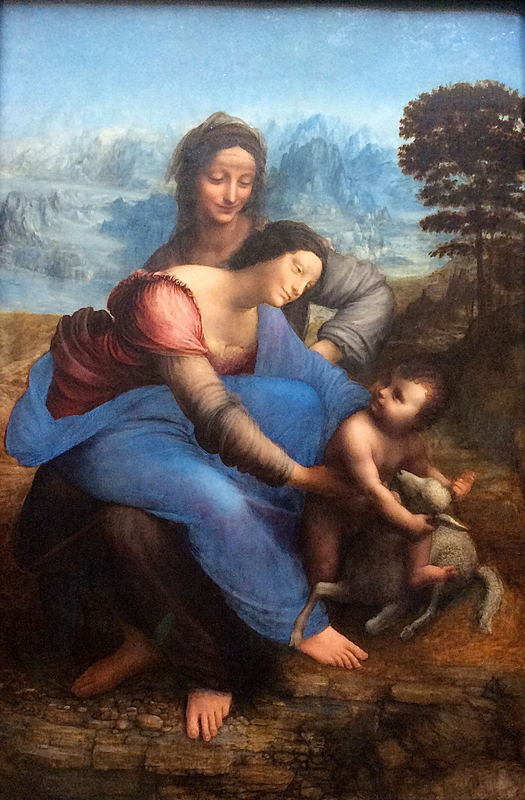 In short, the color was originally like Leonardo's usual works, as shown in the previous example. Raphael is considered the epitome of Renaissance painters. His figures, backgrounds, and moods are idealized and seemingly eternal. 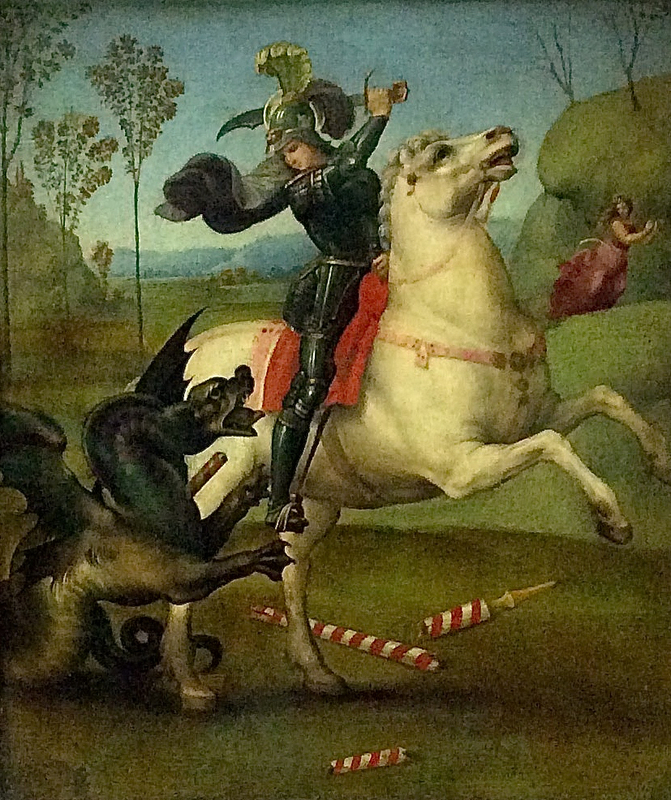 Raphael lived only 37 years, but his output was prodigious and his growth as an artist was amazing. Here's an early work that is a very traditional and literal interpretation of an old story. Compare that with a similar subject painted 15 years later. 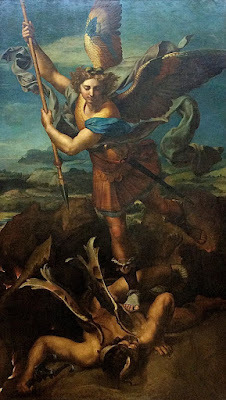 Instead of an earthly knight slaying a dragon, he shows the archangel Michael overcoming Satan, who was also an angel at the start. The composition is much more dramatic and engaging, and the figures more fully developed; even the color scheme is more energized. One of the favorite subjects of the religious orders who commissioned work from Raphael was the 'Virgin and Child with St. John the Baptist.' Though John was only a few months older than Jesus, according to the story, he is sometimes depicted as a few years older, and he is always shown in a worshipful attitude. His role in the story is symbolized by a staff in the form of a cross and a garment made from animal skin. This example by Raphael is like a tableau, with everyone acting out their part. 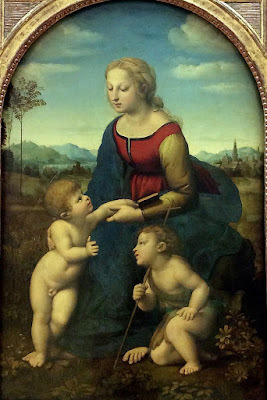 It is pretty, but bland; it reminds me of his teacher, Perugino. Five years later he treated the same subject with a fresh new composition, fuller modeling, gorgeous coloration, and an engaging story: showing off the new baby to a toddler. Mary caresses John, so he doesn't feel left out; her arms create a unified shape with the children. As for portraits with psychological insight, Raphael could do that, too; this fellow looks like a wise and gentle man, maybe a little sad. Plus he has a swell hat, and his fur stole is realized with broad, loose strokes that seem thoroughly modern. 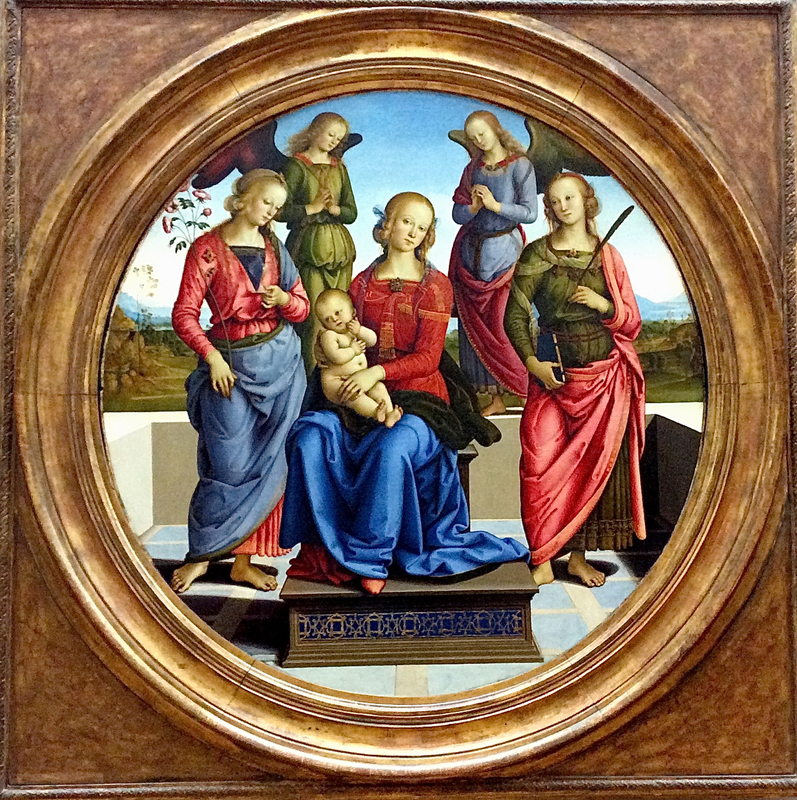 The three most important figures of Italian Renaissance painting are Botticelli, da Vinci, and Raphael. Only slightly less important are Fra Angelico, Mantegna, and Ghirlandaio. As a cultural movement, the Renaissance may be said to encompass most of the 1500s as well as the 1400s, but the ideal Renaissance style of painting began to change soon after the death of Raphael in 1520. The dominant style of painting became more self-conscious, figures were elongated into attractive but unrealistic curves, and emotional qualities were dramatized; in all, you might say it seems mannered, and this style is referred to Mannerism. The most prominent Mannerist painters were Agnolo Bronzino and Giorgio Vasari. Bronzino was the foremost painter of Mannerism. He is known for his elongated figures. This painting by Bronzino is a perfect example of Mannerism. Noli me tangere, meaning "touch me not" are the words Jesus spoke to Mary Magdalene when she recognized him after his resurrection. 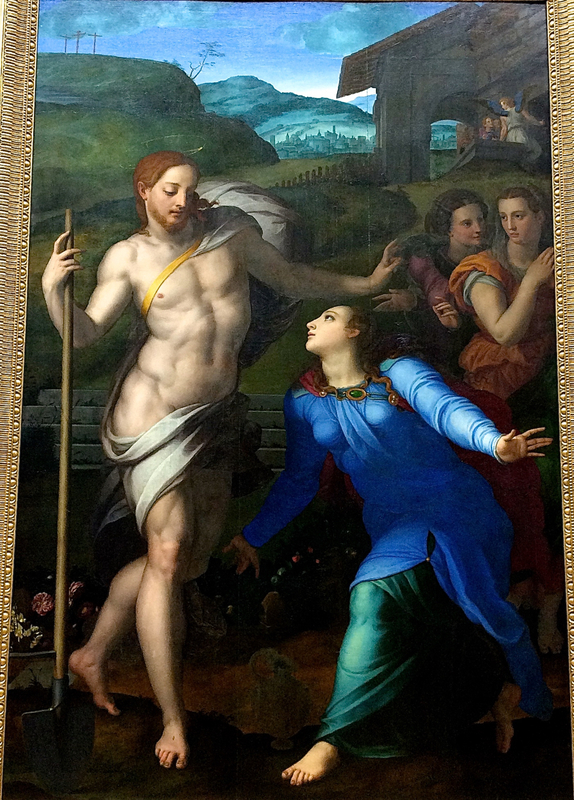 The way Jesus pulls back perfectly expresses that "don't touch me" feeling. Magdalene's exaggerated posture perfectly expresses yearning. 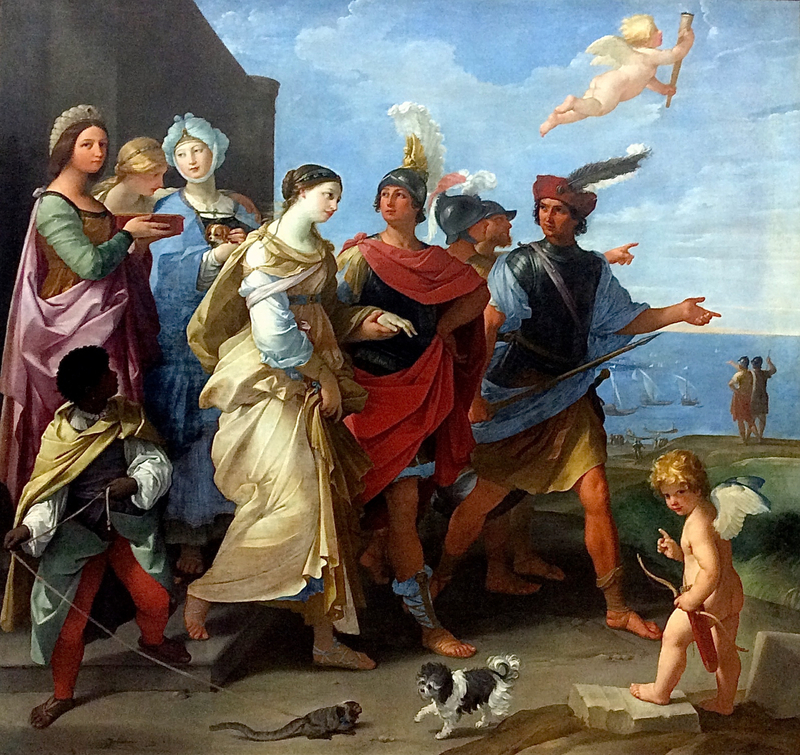 Compositional tension is characteristic of Mannerism. Jesus doesn't want Mary to try to touch him because, essentially, he's a ghost, a spirit, a vision. He appeared to a few people on earth before making his final ascent to Heaven. Vasari was an important painter in the mid-1500s, the period of Mannerism. 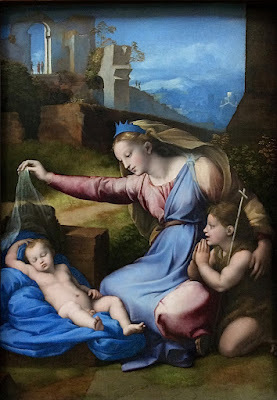 Vasari was thoroughly imbued with the art of the Renaissance, having written about the masters of the previous generation in his book Lives of the Artists. This book is considered the foundation of the study of art history. Vasari's work continues the Renaissance idealism, but adds drama and intimacy. 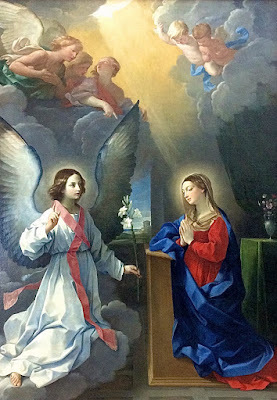 The Annunciation is a standard subject, but this one is reversed; the angel Gabriel is generally shown on the left, but appears on the right in this version. Usually there is some sense of separation between the human and the immortal, and the angel looks rather grand with wings in rainbow hues, but in this painting Gabriel is the same size as Mary and occupies the same space; the two could be girlfriends having a chat. The angel does have a nice cloud to float on and its wings match its costume perfectly. 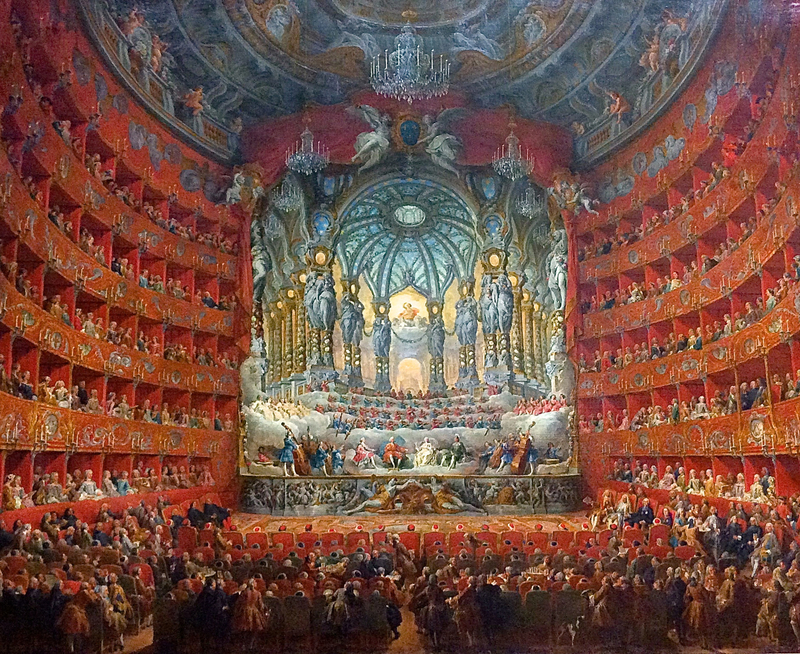 Most of the Italian artists covered so far were centered in Florence or Rome. Venice was like another country, with its own leaders, its own economy, and its own artists. There were several great artists in the Venetian school of art, but they were so different that the main thing they shared was location and patronage. 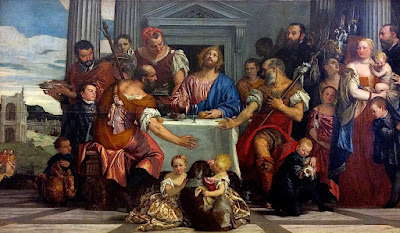 The most important painters of the Venetian school were Titian, Tintoretto, and Veronese. Titian was the dominant force in Venetian art for a half century in the 1500s. His output was vast and varied. 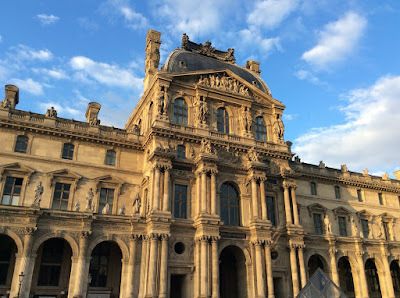 The Louvre showed only a few examples. This work has a relaxed and intimate quality. Mary is showing Jesus a bunny; Jesus, a very realistic infant, seems eager to play with it. 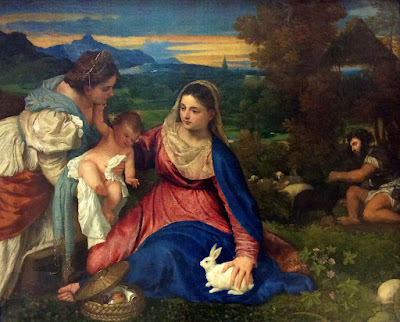 Joseph, who is typically treated as a sort of bystander, is petting a lamb in the background, perhaps thinking about rabbit stew. The other woman is an unexplained bonus, just a pretty figure to round out the scene. Tintoretto was one of the leading painters of the Venetian school. Tintoretto had a penchant for large scenes on broad canvases. He strained to find a subject big enough to meet his vaulting ambition. For awhile he was preoccupied with trying to paint Heaven and all its occupants. In this version, the reason all these beings have gathered is to observe the Coronation of the Virgin Mary by Jesus. Veronese was one of the leading painters of the Venetian school. 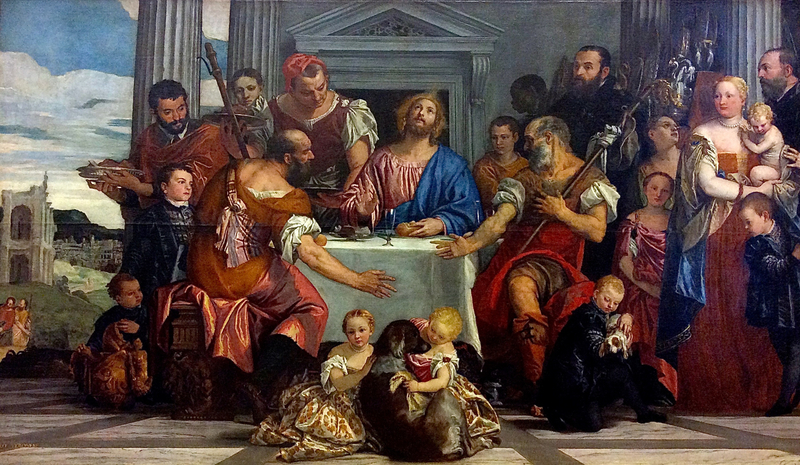 Veronese had a rich and colorful style, and he was given to extravagance of expression. The painting above depicts a standard story of Jesus having supper with a couple of travelers that he meets on the road after his resurrection; each of them holds a staff. Usually this scene has only one or two other characters, who are waiting table. But that was way too simple for Veronese. He had to have a bunch of extra characters, including a pretty lady and a bunch of kids. And what painting is complete without a nice bit of architecture and a little scenery. The major painters of the Mannerist period were Bronzino and Vasari. The major painters of the Venetian school were Titian, Tintoretto, and Veronese. 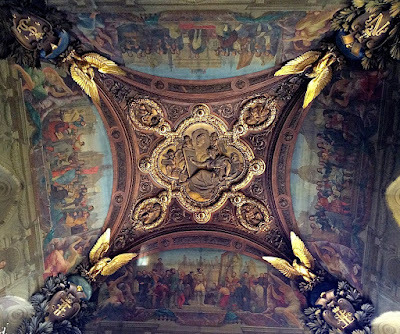 Baroque art is characterized by great drama, rich, deep colour, and intense light and dark shadows. In Italy, the Baroque period was dominated by Caravaggio and Guido Reni. Like Raphael, Caravaggio was a tremendously talented and influential artist despite his short life; he lived 38 years, compared to 37 for Raphael. He introduced a style that was edgy, realistic, and dramatic, qualities that he brought out with high-contrast, stagey lighting. Other painters were captivated by his work, and his influence was profound and wide-spread. 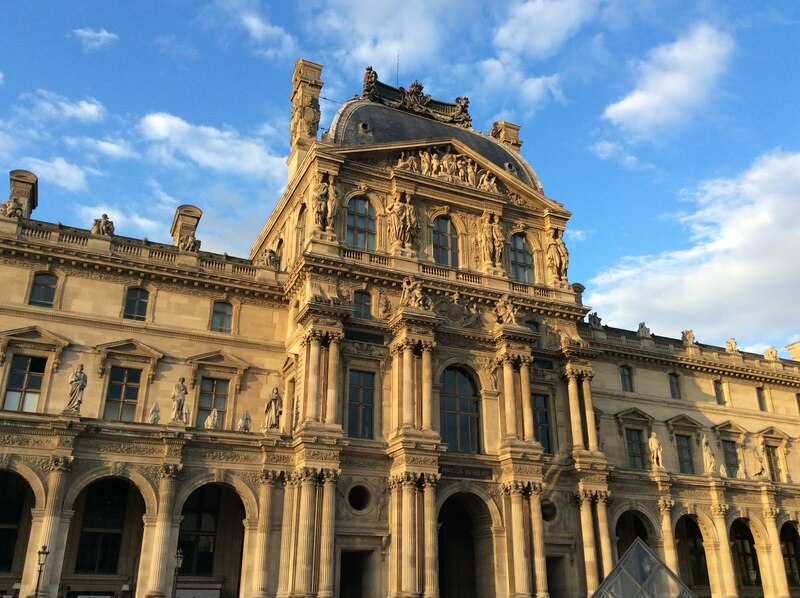 The Louvre has one of his best works. Guido Reni was very prolific and very popular in his time, and the Louvre has many of his canvases. He painted both religious and mythological scenes. He was a contemporary of Caravaggio, but you could say his aesthetic was the opposite. Where Caravaggio was dark and edgy, Reni was bright, balanced and harmonious. 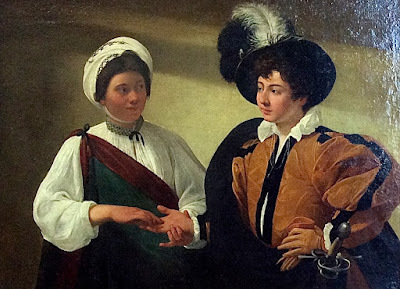 While Caravaggio's characters look real, Reni's are idealized. The two major Italian painters of the Baroque period are Caravaggio and Reni. Caravaggio's high-contrast lighting and his everyday themes influenced painters across Europe all through the 1600s. 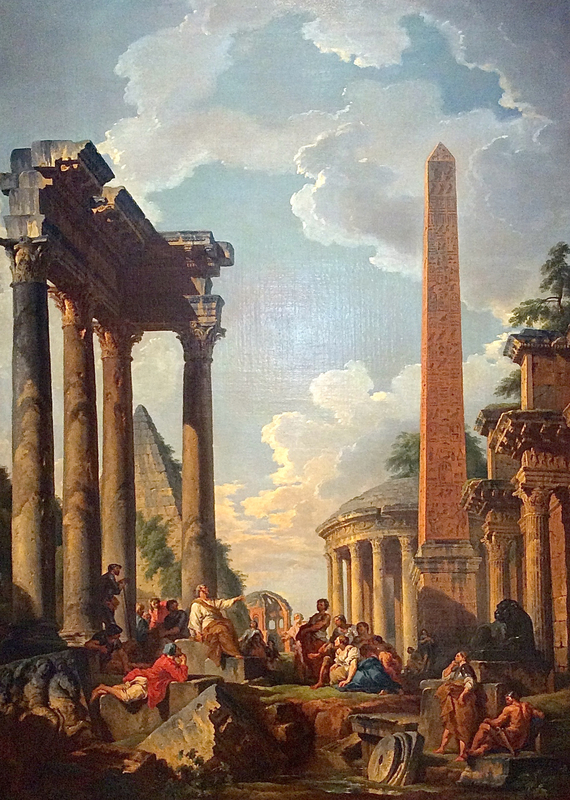 One of the major art trends of the 1700s was the depiction of architecture, especially ruins. 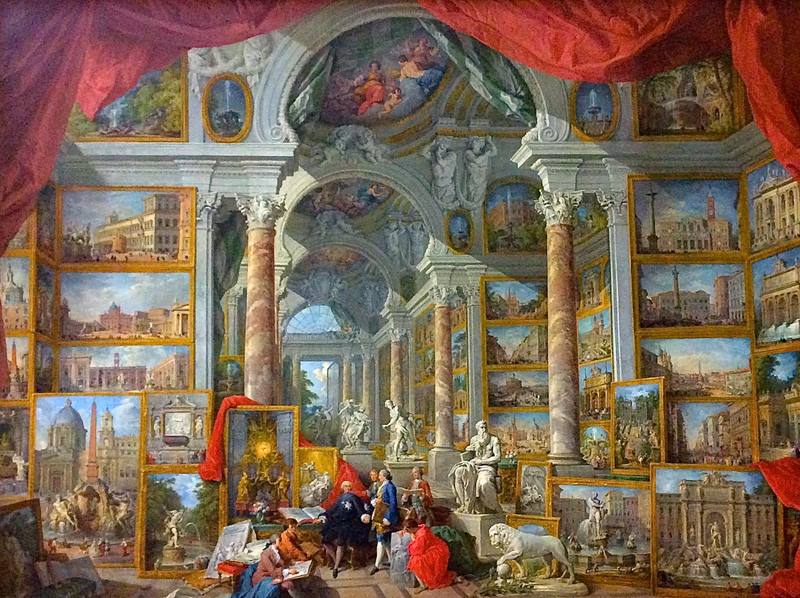 In Italy, the major painter of architectural views was Panini. 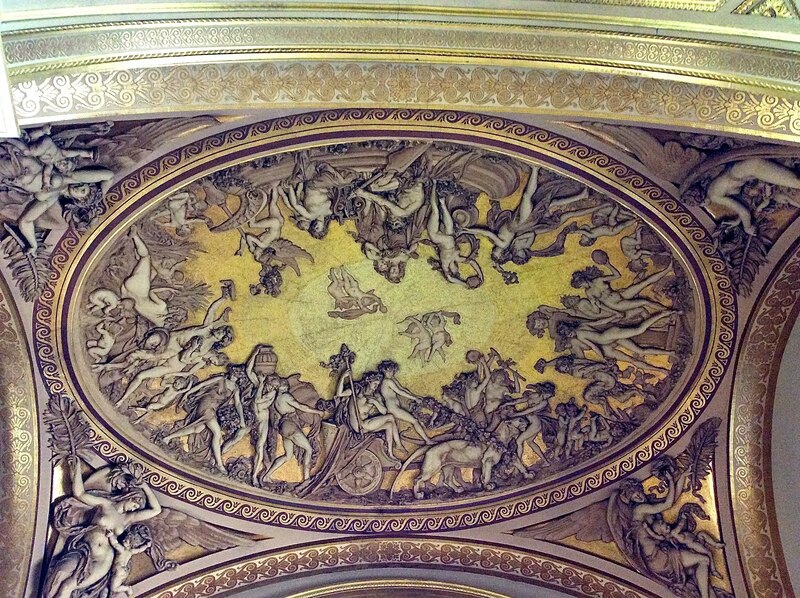 Panini specialized in the depiction of Classical architecture. 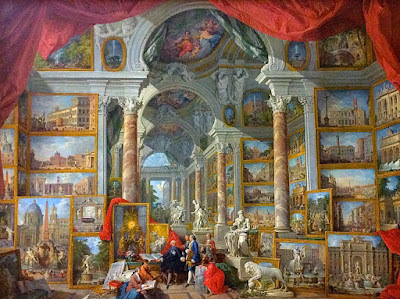 In this painting he imagined a gallery full of paintings of Rome, as it looked in his time, when a lot more ruins were still extant. He framed the scene with drapery to show that it is a product of his imagination; no such gallery really existed. This musical presentation is being performed in honor of the marriage of a prince; his party sits on either side of the cleared space in front of the stage. 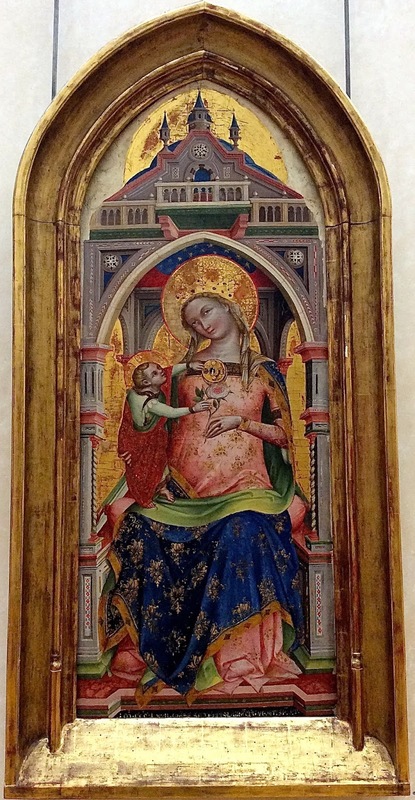 Painting as we know it got started in the late 1200s in Italy. 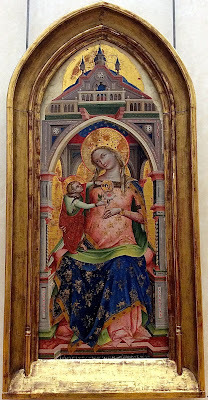 Most early paintings were intended for church decoration, especially altarpieces. 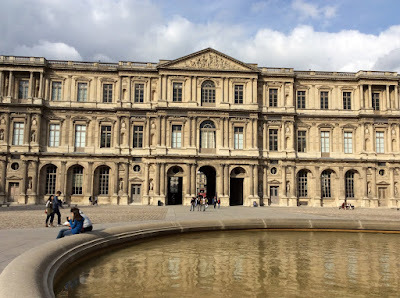 The Renaissance period comprises most of the 1400s and the first part of the 1500s. During the late 1500s, the dominant style was Mannerism. Two important major artists of the Mannerist period were Bronzino and Vasari. 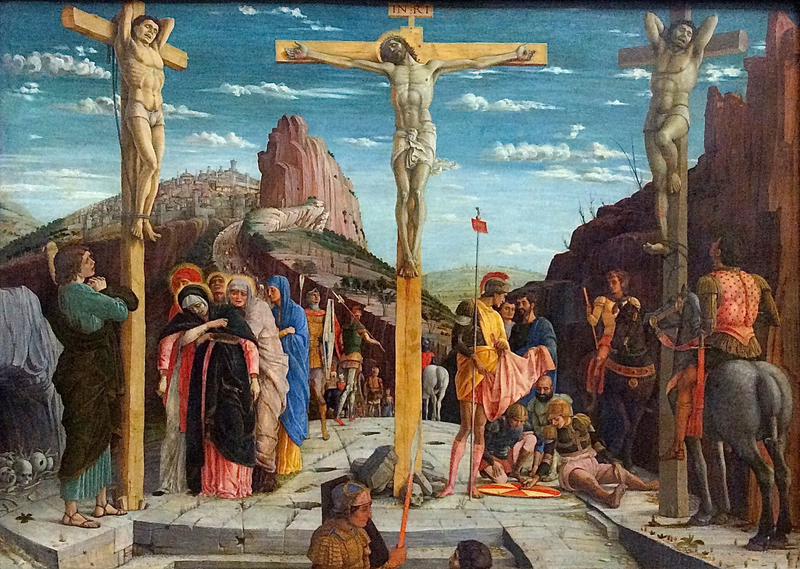 Another important art movement of the late 1500s was the rise of the Venetian school. 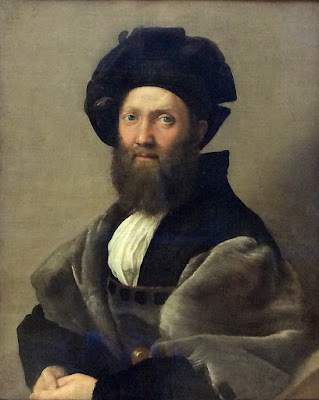 The most important Venetian painters were Titian, Tintoretto, and Veronese. The 1600s was the Baroque period. The most important Italian painters of the Baroque period were Caravaggio and Guido Reni. In the 1700s one of the important art trends was the depiction of architecture, especially ruins. In Italy, the most important painter of architectural scenes was Panini.